Sometimes when the scores are large it becomes difficult to calculate Mean, Median and Modes. When scores are large we use class intervals to represent data as studied in the 5.1.1. Example 2. When scores are represented in class intervals we follow a slightly different method for the calculation of Mean, Median and Modes. Let us study the method using an example. 5.4.1. Example 1: Assume that the following data about the presence of 110 people from different age groups in a marriage function is collected. Note: In the above distribution, we notice, that in each CI, upper limit of a class interval appears again as a lower limit in the next class interval (for example 10 appears twice, once in CI: (0-10) and in CI:(10-20)). Thus the question arises where should the score for upper limit (10) be included? However, by convention the upper limit is not included in the corresponding class interval and is included in the next class interval. Let us calculate the mean, median and mode for grouped data. Similarly Median would be in the interval ‘30-40’ (which has 55th and 56th occurrence of the score). ‘Cumulative frequency’ of a class interval is sum of all the frequencies of all the class intervals up to this class interval. Since number of score is 110, Median must be between 55th and 56th score which is in the class interval ‘30-40’. (because up to the class interval 20-30 we have 44 (cf) scores and up to the class interval 30-40 we have 70 scores (cf)). L= Lower limit of the class interval which includes the median score (This CI (’30-40’) is also called Median class interval) = 30 ?? Let us take the following example of attendance of a class for 2 different weeks in a month. 2. In the second week, the deviations from average are not high. In simple terms we can say that attendance is consistent in the second week. Thus we conclude that, average may not give a correct picture. Therefore we need other measures to arrive at meaningful conclusions. 1st Quartile (Q1), 2nd Quartile (Q2), 3rd Quartile (Q3). They are scores at 1/4th, 1/2nd and 3/4th the distribution of scores. We note that 2nd Quartile is the Median itself. -for Q1 the score to be considered is 3rd (1/4th of 11) score = 23. As the name suggests, here we calculate the average deviation from the mean. Note: Mean Deviation can be found in two ways - using Median method or using Mean method. 5.4.3 Example 1. Calculate the mean deviation for the scores given below, by BOTH methods. In the above calculation |D| is the absolute value of D (we consider value of D as always positive). In earlier sessions we have seen that, graphical representation of data is always easy to understand and interpret. Two important types of representations are histogram and frequency polygon. Histogram: Here we represent the distribution in vertical rectangles. The rectangles are drawn side by side. The vertical height is proportional to the frequency and is represented on y axis. The class intervals are represented on x-axis . We need a graph sheet for this type of representation. Class intervals (CI) are marked as the base of rectangle on x axis. Frequencies are marked as the height of rectangle on y axis. Step 1: Take a graph sheet. 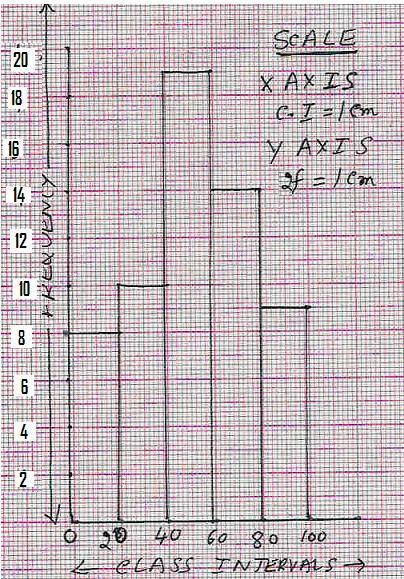 Mark 0 and draw x –axis and y-axis. 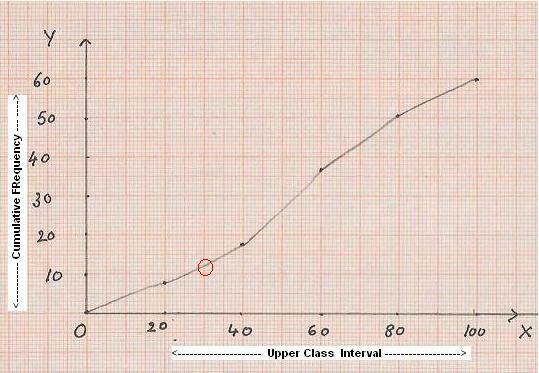 Step 2: On the x-axis mark the class intervals adjacent to each other from 0. Step 3: Convert frequency to a suitable unit so that the graph fits into one page easily. 8f =4cm, 10f =5cm, 19f = 9.5cm, 14f = 7cm and 9f =4.5cm. next to the previous one, so that these two vertical bars have a common side. Draw the remaining rectangles for other class intervals. 2.The scales chosen for both the axes need not be same. 3. Since the sizes of class intervals are same, width of the rectangles are also same. 4. Since there are no gaps in the class intervals the rectangles are contiguous (No space in between them). 5. Height of the rectangle is proportional to the respective frequencies of the C.I. Note : If there are breaks in the class intervals(usually in the beginning) a zig-zag curve (is drawn between the class intervals). Step 1: Draw the histogram as above. one each at two extreme ends (i.e. (-20) - 0 on the left side and 100 -120 on the right side). (at -0.5, 0.5, 1.5, 2.5, 3.5, 4.5 and 5.5cms on x-axis and y being (0, 4, 5, 9.5, 7,4.5 and 0 ) respectively). (i.e. (-20) - 0 on the left side and 100 - 120 on the right side). (in this example 1C.I. = 1cm). These points are -0.5, 0.5, 1.5, 2.5, 3.5, 4.5 and 5.5 on the x-axis. 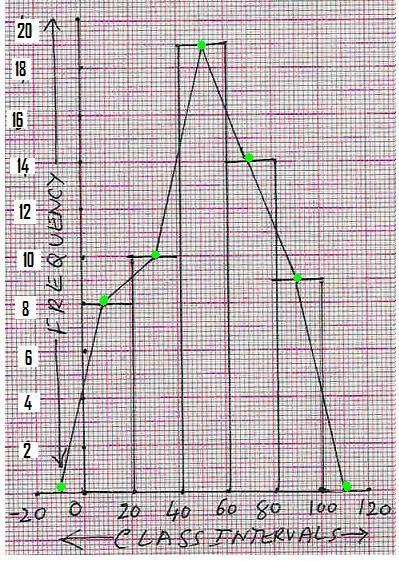 Step 3: Identify the height of frequency for each class interval as per the scale used (2f=1cm). These points are 0, 4, 5, 9.5, 7,4.5 and 0 on the y-axis. Step 4: Plot and join these points. Note : If the mid points of class intervals are very close, then we get a frequency curve by joining these points by a smooth curve rather than joining by straight lines. In this type of graph we plot the points corresponding to cumulative frequency for the given data (Ungrouped or grouped) and join the points by a smooth curve. The given data (actual score or Upper class limit in case of grouped data) is marked along the x-axis. Cumulative frequency is marked along the y-axis. Let us again consider the same example we have taken in 5.4.5 Example 1. (In this case -20 to 0). with the imaginary class interval (-20 to 0). (In this case let 1cm=10 upper class limit). 6. Join these points by a smooth curve (This curve is Ogive). 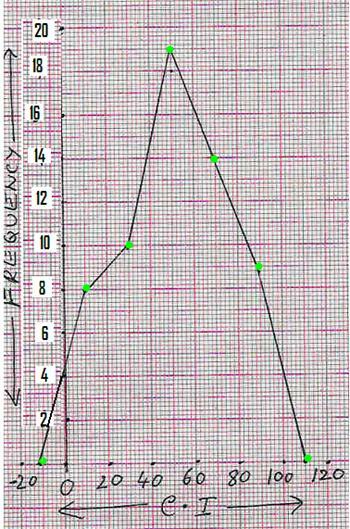 From the cumulative frequency curve it will be easy to arrive at frequencies for different class intervals. (For example: From the above graph we can conclude that the cumulative frequency for scores up to 30 is 13. This point is circled red in the graph). This method is very useful when class intervals and their frequencies are very large. In this method we assume one of the mid-points to be the mean and find the deviation from that mid-point and hence this method is called ‘assumed mean method’. Let us take the example solved earlier (5.4.1 Example 1) to illustrate this method. This is the same value(approximate) which we got earlier.